Eckerton Hill makes use of our covered growing space by continuing to cultivate cold hearty crops through the winter season. 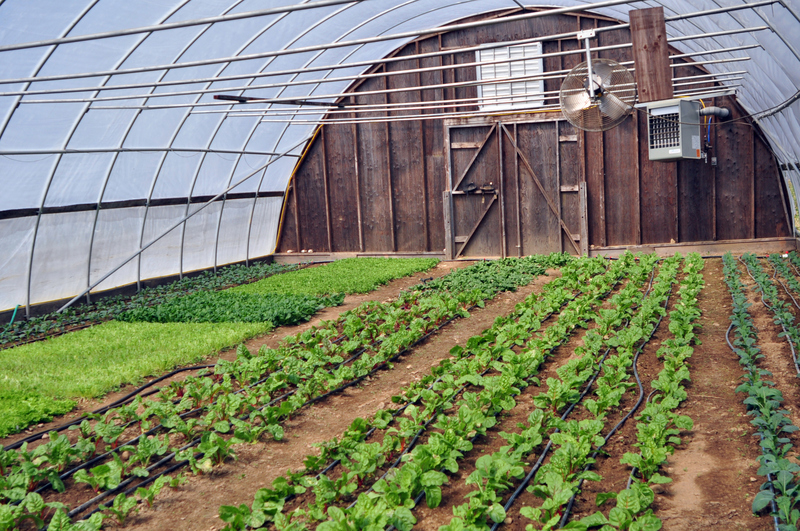 We offer our weekly harvest to the local community via our Winter CSA. 117 Lobachsville Road, Fleetwood, PA 19522 along with corresponding payment. A winter harvest-share program known as CSA (Community Supported Agriculture), or a network of people who pledge to support a local farm. CSA members make an upfront payment at the onset of the growing season in exchange for a share of the anticipated harvest. This initial capital helps the farm fund necessary supplies, seed and labor when it needs it the most. Once harvesting begins, members receive weekly shares of the fruits and vegetables. Eckerton Hill Farm is known for our specialty and heirloom varieties of fruits and vegetables, much of which cannot be found in your typical grocery store. Membership has many benefits: to enjoy locally raised foods; expand the variety of foods in your diet; support sustainable farming; and simplify your food sources through add-on shares that include breads, eggs, cheeses, and mushrooms, all from local artisans to be picked up with your weekly CSA share. What does a sample share look like? The contents of the shares include a variety of cold-hardy vegetables, including a mix of storage crops (squashes, potatoes, onions, garlic, etc. ), root crops (radishes, beets, carrots, turnips) cooking greens (kales, chards, beet greens, etc. ), and fresh cut salad greens (mesclun mix, arugula, spinach, lettuce heads, etc.). We offer two sizes of shares: regular, which consists of 6 items and large, which consists of 9. We recommend the regular share for a couple or a small family, and the large share for a large family (or people who like a lot of veggies). A sample for each share is below. A regular Winter CSA membership costs $200 and consists of 6 items of produce with a value of $25 per week. A large Winter CSA membership costs $280 and consists of 9 items with a value of $35 per week. We ask that members submit their payment up front for the season. If this is a concern for you, please contact us. We are open to establishing a payment scheme that works for you. Families living in or near Berks County are welcome to join the Winter CSA, which will run as a weekly distribution for eight weeks beginning Wednesday November 4th and ending Wednesday December 23rd. Pick up will be Wednesdays at the below locations and times. Click here for the registration form. Please fill out the final page of the registration form and mail it to us, along with a check made out to Eckerton Hill Farm for the appropriate amount, at 117 Lobachsville Road, Fleetwood, PA 19522. Thanks for supporting small farms! We look forward to sharing our winter harvest with you!